The Canadian Association of Orthodontics (CAO) recommends that all children have a check-up with an orthodontic specialist no later than age 7. The posterior occlusion is established when the first molars erupt. At that time, one can evaluate the antero-posterior and transverse relationships of the occlusion, as well as discover any functional shifts or crossbites. Incisors have begun to erupt and problems can be detected such as crowding, habits, deep bites, open bites and some jaw discrepancies. For some, a timely evaluation will lead to significant treatment benefits; for others, the principal immediate benefit is a parent’s peace of mind. 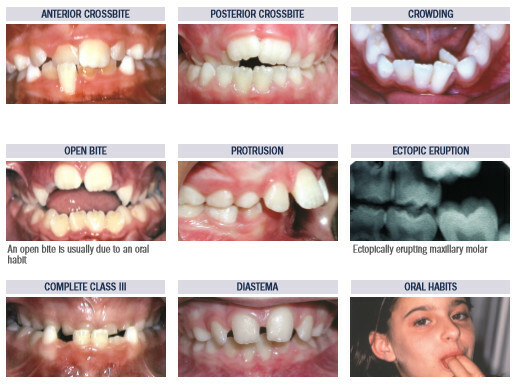 The CAO does not advocate comprehensive orthodontic treatment at age 7. However, interceptive treatment may be appropriate in the kinds of problems shown on the reverse.